It is understandable that the world’s most famous bike race is the 24-day, 2,500 mile Tour de France, since France is the bicycle’s country of origin. The first bicycle was actually a crude wooden hobby horse made from a curved beam with a padded seat and attached to two wooden wheels. It was first called “Celerifere” and later “Velocifere” by its French inventor, Comte de Sivrac at the turn of the 19th Century. The Velocifere had no steering and no pedals. The rider straddled the beam and pushed at the ground with his or her feet to propel this first bicycle. In 1816, German Baron Karl Von Drais added a fork to the front wheel of a similar contraption, which enabled the rider of the “Draisiene” to steer. Drais brought his human powered vehicle to Paris in 1818 to promote it as a new form of recreation, and it created a sensation. Englishman Denis Johnson introduced the concept to England with an adjustable seat, a special handlebar configuration (which included forearm rests) and a dropped center beam to allow bolder ladies to ride in skirts without sacrificing modesty. Later, a Scottish blacksmith named Kirkpatrick Macmillan devised a leverage device which was attached by rods from the rear axel to pedals near the front wheel that when pushed with the feet, propelled the bicycle forward without wearing out shoe leather. Ironically, the excitement stirred up when Macmillan’s device appeared in the streets led to his arrest, rather than to his celebration. It was Pierre Lallement, a French immigrant to the United States, living in New Haven, Connecticut, who obtained the first United States patent for an “improvement to velocipedes,” Patent #59915. Lallement installed pedals to the vehicle’s front wheel axel for propulsion and added a spring mounted seat to absorb the shock caused by bumps in the road. Nevertheless, his velocipedes earned the nickname “the boneshaker.” In 1869, the Hanlon brothers of New York City were awarded a patent for their bicycle improvements, which included adjustable pedals, rubber rings on the wheel rims, a front fender for fending off mud spray spinning up at the rider from the front wheel and a brake on the rear wheel, operated by twisting the handlebars to press a brake shoe against the rear wheel rim. In the 1870’s, wire wheels began to replace the heavier and inflexible wooden wheels, and a chain driven rear wheel was invented by Englishman J. H. Lawson to improve the pedaling leverage. Until Lawson’s chain drive, pedaling leverage had been achieved by having a much larger front wheel with pedals attached and a small rear wheel. This large wheel-small wheel bicycle was nicknamed the “Penny-Farthing” after the larger and smaller English coins. The Avril, a more comfortable variation of the Penny-Farthing, was introduced to America at the Centennial Exposition that was held in Philadelphia, Pennsylvania in 1876. Following the Exposition, the Cunningham Company of Boston began importing Avrils from England. The development of the modern bicycle was advanced significantly when a veterinarian in Belfast, Northern Ireland named John Boyd Dunlop invented pneumatic tires to cushion his son’s tricycle ride. He patented the Dunlop inflated tire in the United States in 1890. The first six-day bicycle race in America was held on Dunlop tires in the old Madison Square Garden in 1891. “Plugger” Bill Martin pedaled 1,466 miles and four laps on his safety racer to become the champion. The first American World Champion Amateur cyclist was Arthur A. Zimmerman, who won both the one mile and ten mile events in Chicago, Illinois in 1893. Col. Albert A. Pope began mass producing the first American bicycle, the “Columbia,” in 1895 in the factory of the Weed Sewing Machine Company in Hartford, Connecticut. At $313.00 each, the Columbia, which weighed 70 pounds, was hard to afford and hard to lift. The design, technology and popularity of bicycles and cycling continued to advance dramatically during the 20th Century. 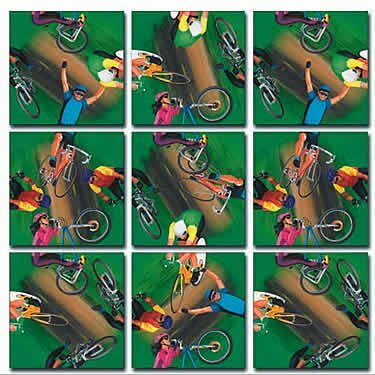 Today, hundreds of millions of children and adults the world over ride racers, cruisers, mountain, hybrid and bmx (bicycle motocross) bikes for healthy recreation, whether to commune with nature, compete for honors, pursue physical fitness or simply to enjoy inexpensive transportation.